LG execs were "speaking in generalities"
"Our CFO gave some estimates at the LG second quarter earnings press conference on Wednesday but he was only speaking in generalities, not confirmed facts. He is, after all, our CFO not our CMO. So while it's likely that the timing he mentioned is accurate, we won't know for sure for a few more weeks. "We hope to have all major carriers on board when G2 launches in key markets. CFO was speaking from the point of view of where we stand now but a lot of things will change between today and launch time." 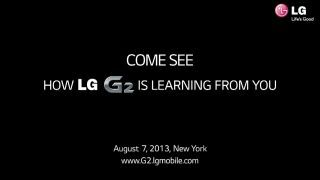 The LG G2 will be launched on Aug. 7, which means we have a lot more info going into the device's debut event than we do most launches. Sometimes it's really hard to keep a secret, and according to Korean site The Kyunghyang Shinmun, the phone's release window and an additional carrier were secrets too big for some at LG to keep. The G2 will launch next month in Korea, September in North America and Europe, and October in other regions, with Verizon as an official carrier partner in the U.S., the report revealed. That info reportedly comes by way of LG Electronics' CFO David Jung and another, unnamed executive, who allegedly just couldn't hold their tongues for another couple weeks. TechRadar asked LG to confirm or deny that the executives spilled said beans, and we'll update this post if we hear back. The LG G2 is expected to follow in the footsteps of the Optimus G and Optimus G Pro, two respectable heavyweight devices - just don't call it the Optimus G2. Little about the G2 is official, but rumors peg it has having a 5-inch 1080p display, a 1.7GHz or 2.3GHz quad-core processor, 2GB of RAM, 32GB of storage, and a 2610mAh battery. That battery could also come in at a full 3000mAh or a mere 2540mAh, depending who you listen to. The latest G2 battery rumor also came with an interesting picture of the device with several multi-colored backs in red, blue, pink and grey. It's unclear whether we're seeing the back of the device there or just cases, but either way it seems G2 owners will have some color in their lives. Hmm, TechRadar wonders if this LG G2 will makes the Best Verizon phones list.